How money-savvy is your teen? 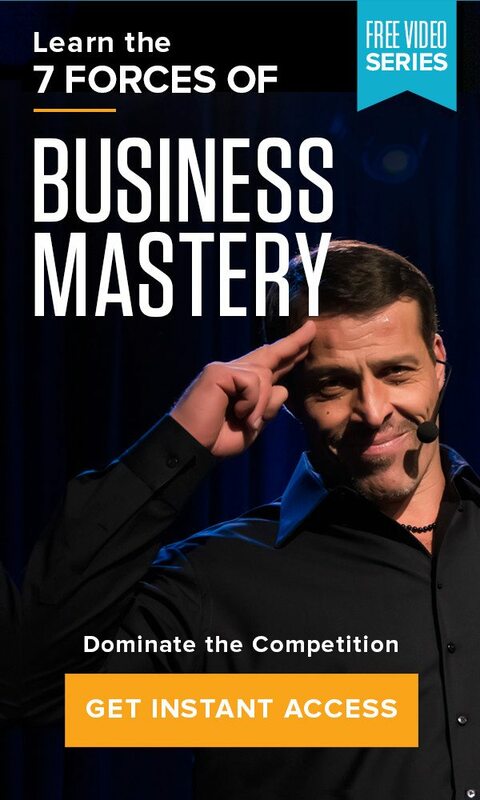 Home » The Tony Robbins Blog » Wealth & Lifestyle » How money-savvy is your teen? Meet Megan. Megan just graduated from college and has about $35,000 in student loans and $5,000 in credit card debt. Fortunately, Megan was able to secure a job, which pays $45,000 annually — the average across the country for recent college grads — which means that every month, she will take home roughly $2,700. Like most recent grads in her position, Megan doesn’t set a budget for herself. She’s not thinking about saving for the future or putting money into an emergency fund. After all, retirement is 43 years away and as it is right now, she can barely afford rent. And rather than making a concerted effort to pay down her credit card debt, she pays the minimum balance due. In fact, some months, she misses the payment altogether, because she’s not completely aware of how important her credit score is. Fast forward 15 years. Megan is still making many of the same financial mistakes. But now, her credit card debt has increased substantially, the interest on that debt has skyrocketed, and she is still paying off her student loan debt. And because of missed payments and increased debt, her credit score has plummeted. On the plus side, she has started thinking about retirement, but she still only has less than $25,000 put away. Does Megan’s story sound familiar? It may, because it’s the story of tens of millions of Americans today. The alarming truth is that, in total, American consumers owe $918.5 billion in credit card debt and $1.19 trillion in student loans. As for retirement, most Americans are grossly unprepared, with 57% reporting to have less than $25,000 put away in savings or investments for the future. And money continues to be the leading cause of stress for Americans and the most common cause of conflict in a marriage, with a whopping 76% of people saying that they feel out of control when it comes to their finances. How did we get here? If money is such a critical factor in the quality of our lives, why were we never taught the importance of personal finance? What if we were able to go back to Megan and give her better guidance on her personal finances? What if she were required to learn the basics of paying bills, building good credit, budgeting her income and paying off debt in high school? Would this make a difference in her financial future and ultimately, her quality of life? 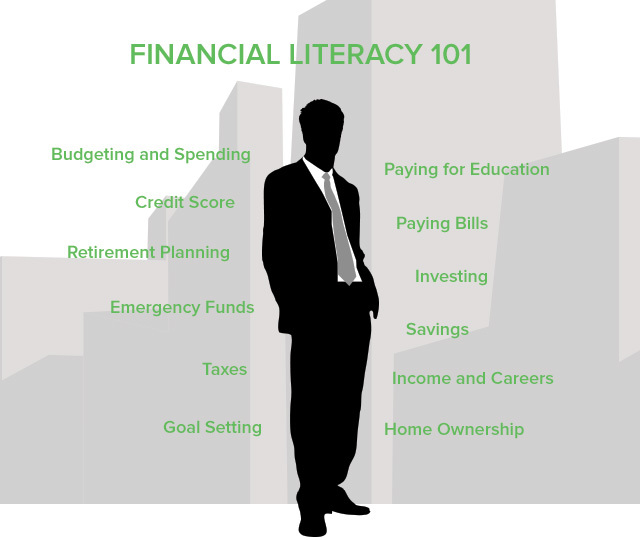 A recent study conducted by the Center for Financial Literacy at Champlain College in Burlington, Vermont, graded states on their efforts to improve financial literacy in high schools. Only five states across the country scored an A. These states — Alabama, Missouri, Tennessee, Virginia and Utah — require students take a dedicated semester of personal finance courses. Utah, the only state to receive an A+, mandates students learn about savings, investments, credit and online banking. Students there are also required to take and end-of-course financial literacy assessment administered by the state. And teachers of the personal finance course receive special training on topics like financial training, credit and investing. On the other end of the spectrum, nearly a quarter of the states — including California, Massachusetts and Pennsylvania — received a failing grade. 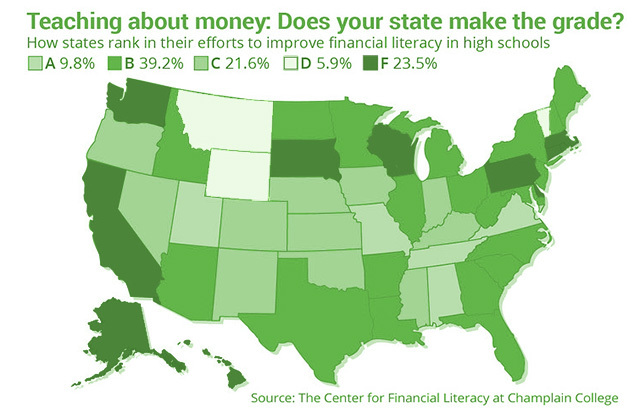 These states have, according to the report, virtually no requirements for teaching financial literacy at the high school level. In lieu of high school courses, a number of students have to rely on their parents for financial guidance, which can be particularly problematic. For one, parents may be uncomfortable talking about money. In a 2014 survey from T. Rowe Price, parents were more inclined to talk to their children about alcohol and drugs than finances. Many adults may also lack the necessary financial knowledge to give sound advice. According to a recent survey from GoBankingRates.com, more than 60% of adults do not have a financial cushion for emergencies. “When you look at the adult behavior, you can’t help but wonder whether or not these adults are doing a good job teaching their children,” said John Pelletier, director of the Center for Financial Literacy and author of the report. This means students will ultimately have to learn financial lessons through trial-and-error, which can deal a hefty blow, especially considering that the majority of young people have no baseline to attach their expectations to. Pelletier has noted that he’s walked into a number of classrooms where the bulk of students believe their chosen career will make them at least $100,000 a year. This is particularly critical for the 71% of bachelor’s degree recipients who will graduate with a student loan. According to a recent survey from the Pew Charitable Trusts, nearly a third of white student loan borrowers and roughly a half of black and Hispanic student loan borrowers under the age of 50 said they would have found a different way to finance their education if they could make their borrowing decision again. Of course, whether or not high schools should be responsible for teaching students personal finance skills is still up for debate. If financial literacy were mandated by the state, schools would have to train or hire new staff and implement new resources, which could put additional strain on already strapped budgets. But it is clear something must be done. Students need to understand that no matter what career path they pursue — whether they become a teacher, a physician, an artist or an engineer — they will need personal finance skills. And in an age of predatory lending, speculative investments and rampant consumerism, the earlier they can begin to become financially literate, the more prepared they will be to make the best financial decisions for their future.